"Torment" - Part 6: "Release"
Inside The Source Highfather realizes that his staff has been taken. Superman wants to retrieve it but Highfather repeats his previous statement that leaving is impossible. In the depths of Tartaros Batman uses the steamy water channels to bring Bekka back around. Once she revives they nearly give into their passions, but Desaad's experiments with Highfather's staff distract their amorous activities. Desaad attempts to betray Darkseid and take the Omega Power for himself. He soon learns that there is a price for that power and it's not one Desaad is capable of paying. Darkseid explains why he is the only one suited to wield the power as he begins to absorb it from Desaad. Batman and Bekka attack with Bekka taking the lead. She provides enough of a distraction to allow Batman to grab the staff, which he uses to free Superman. 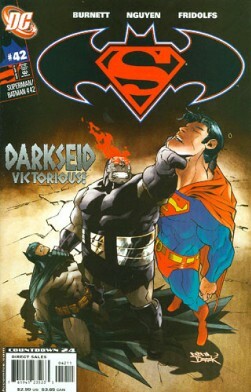 Superman lands a few powerful blows on Darkseid before the dark god escapes, leaving Superman, Bekka and Batman behind. The three heroes and Scarescrow travel to Earth via Boom Tube. After Superman flies off with Scarecrow Bekka and Batman nearly have another moment before Orion appears. Bekka departs with her husband leaving Batman and eventually Superman behind. On New Genesis Orion chides his wife's indiscretions as he prepares to leave on a diplomatic mission. After he leaves Bekka is attacked and killed by a shadowy force who announces that the end has just begun. Story - 3: First off, this was a decent ending. I even liked it a little bit, which is saying a lot because SUPERMAN/BATMAN is becoming one of those titles that are placed at the top of my reading list only because I review it. Otherwise it would be towards the bottom, before the one book I bought only to finish a storyline. There isn't a whole lot to talk about in this issue. Superman comes back. Desaad tries to betray Darkseid. Bekka and Batman almost go all the way and then don't. Orion shows up. Darkseid is back being the big bad guy. Oh, and the story ties into DEATH OF THE NEW GODS. Because we couldn't have a book that didn't tie into another book, right? I mean we couldn't have a story that may have something to do with the continuity of the book it appears in and not have something do with another mini-series or event going on elsewhere in DC's books. Back in the eighties DC had a tag line. "DC," it read, "There's no stopping us now." Maybe now it should read, "DC. There's no stopping us from having every book connect because why buy one book you like when you can buy sixteen that are mediocre?" So that kind of irked me. This title has had so many problems over the past two years or so that it seems that the book would be better served by telling some really great Superman and Batman stories instead of trying to tie it into a major event mini-series. More than that I think this story suffered from being two chapters too long. This may sound like an older comic fan complaining about these comics today with their never-ending storylines and their big events. It's not that at all. It all comes down to the stories I like to read and for reasons that have solely to do with personal taste I don't like long, extended storylines that are more focused on little character moments than balancing action, character and plot. Alan Burnett is a fine writer. He's got a good background with these characters. Six issues was just too long. Fits nicely into a trade. On a monthly (or lately bi-weekly) basis it's a bit much. In the end it wasn't a bad story. I just didn't care for it. That's me, though. You could feel different. There's always next month, right? Art - 3: Eh, it was what it was. The art in this story wasn't terrible, I just didn't care for it all that much. To some extent it fit the mood of the story, but at the end of the day I just like a smooth, slick style. Plus there was a little too much skin in this story. It seemed a tad unnecessary. Cover Art - 3: This isn't a bad cover. It's pretty dynamic. I just don't like how Darkseid is drawn. He's a little too thick in the middle. Sure I am too, but I'm not a dark god. At least I don't think I am.